Benchmarking – the process of determining your buildings efficiency using billing, building and occupancy size and analysis (based upon the Energy Use Index method) to score the building. 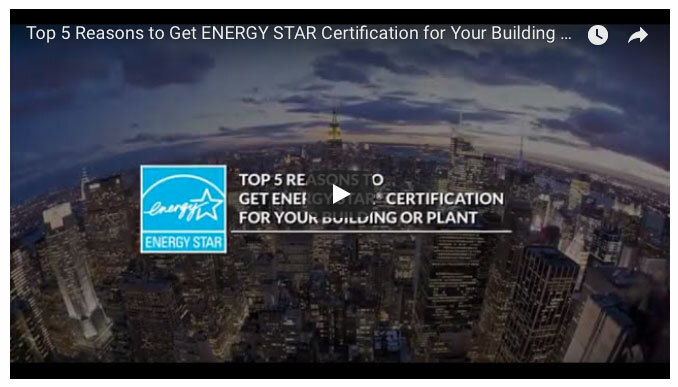 Certification – if the benchmark scores returns 75 or higher, a building is eligible for Certification, which enables building ownership to obtain EnergyStar status to show show the businesses commitment to sustainability, social responsibility, and lowered environmental impact. Many companies are investing in energy efficiency and finding ways to drive sustainability within their facilities and organizations. This leads to lowered maintenance, an improved workplace and of course increased profitability. The challenge is that there are only a few programs in existence to distinguish your business as a leader in social and environmental responsibility. Both EnergyStar and LEED (Leadership in Energy and Environmental Design) are fairly cumbersome to navigate if you are not familiar with them, and therefore are not implemented as often as they should be to show suppliers, customers and prospects a companies commitment to sustainability (and higher margin business). Most companies who have already made efficiency improvements in refrigeration and lighting will score 75 or above and qualify for certification. To become EnergyStar Certified, we work with your building architect, or a local architect or Physical Engineer to verify all of the data and analysis from our benchmarking study. Once validated, their sign-off is accepted by EnergyStar and we apply for certification. There is a small fee to pay for the Architect or PE’s time. For non-customers wishing to become benchmarked, we will work with you to design a cost model that fits your budget. Apply for EnergyStar certification and receive plaque, status and usage of EnergyStar logos and branding for building, marketing material, press releases, etc. To start, schedule a 30 minute discussion with one of our Energy Analysts to determine if EnergyStar is right for you. If if it’s decided that we move forward, we’ll provide you with a simple list of questions and the information needed to start the benchmarking process.